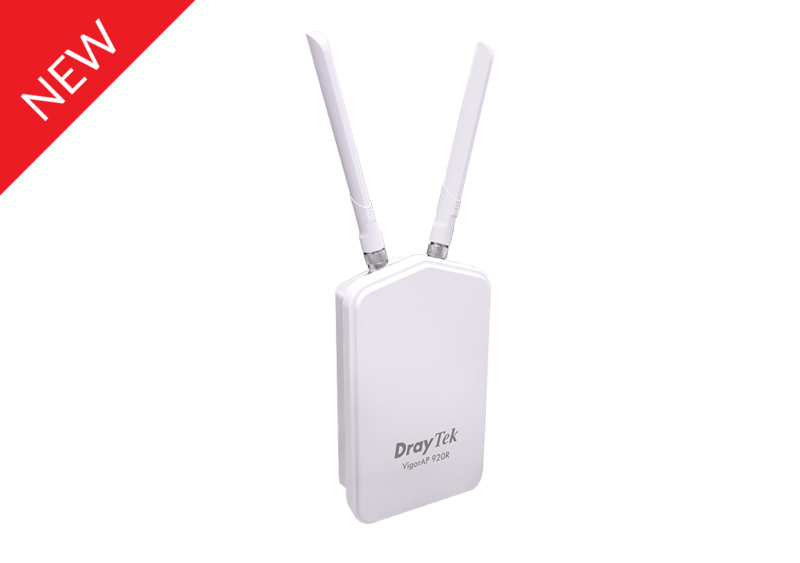 The DrayTek VigorAP 920R Series access point is designed for outdoor applications providing high-performance wireless connectivity in harsh environments. Featuring IP67 certified enclosure and industrial-grade components, VigorAP 920R Series is able to withstand wind, rain, snow and tolerates extreme operating temperatures between -40°C and 70°C. 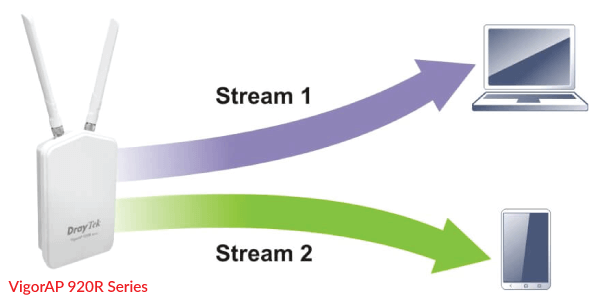 Furthermore, its 802.11ac Wave 2 compliance ensures a fast and reliable connection even in a high-density network. The VigorAP 920R Series AP can be pole-mounted using the supplied adjustable mounting brackets. 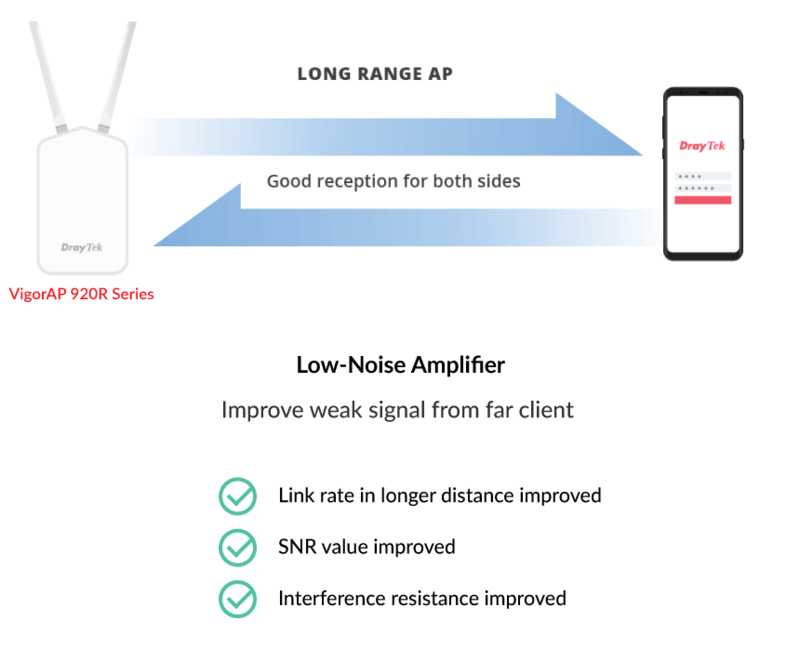 The concurrent dual band Wi-Fi feature in the VigorAP 920R Series, supports up to 128 clients on each Wi-Fi band giving a total 256 clients over both bands. It features the latest Wi-Fi technology, 802.11ac Wave 2 in the 5GHz band and 802.11n in the 2.4GHz band. The support of Multi-User MIMO (MU-MIMO) allows it to deliver high-performance wireless connection even in a crowded network. MU-MIMO technology allows the AP to communicate with multiple clients concurrently thus improving throughput. VigorAP 920R Series is IP67 certified water and dust-resistant. Along with its industrial-grade components, the VigorAP920R can withstand wind, rain, snow and tolerate extreme operating temperatures between -40°C and 70°C, making it suitable for extreme weather conditions. Gore-tex design allows any moisture build-up to escape. 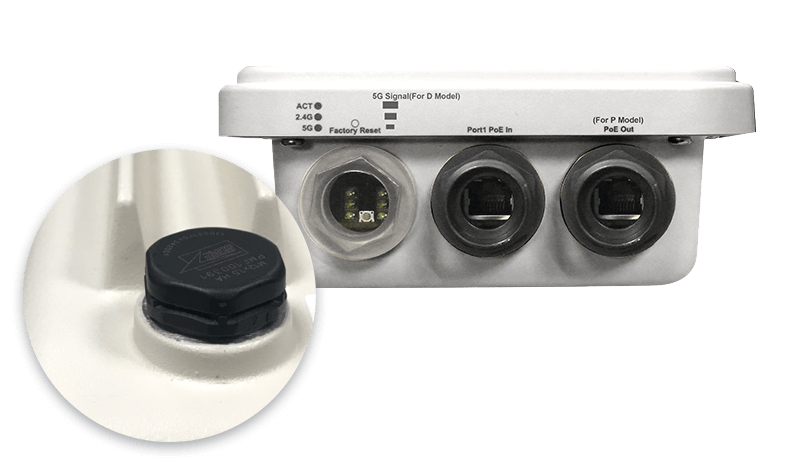 Power to the VigorAP 920R Series AP is provided through the Ethernet cable from a PoE Ethernet switch or PoE injector providing flexible installation without the need for a nearby power source. In addition, the VigorAP 920RP/RPD can also provide power to another PoE-PD, such as an IP camera. To save energy, the VigorAP 920R Series is IEEE802.3az compliant reducing its energy consumption when data activity is low. The VigorAP 920R Series AP can be managed and monitored through the VigorACS 2 central management system. 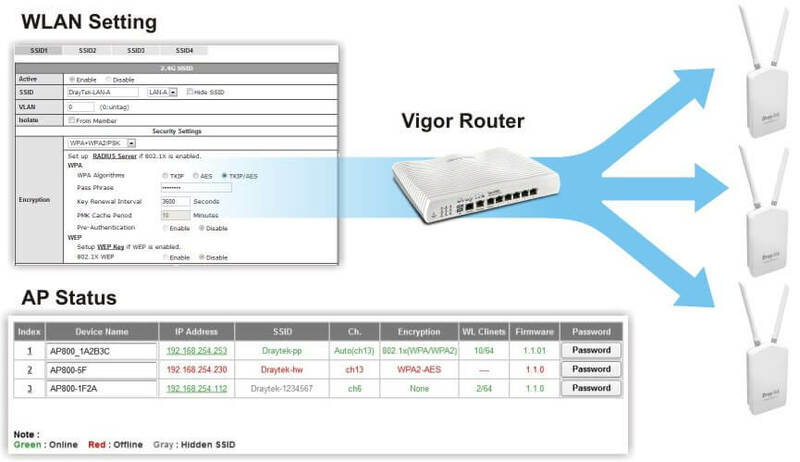 It can also be managed through the Central AP management feature of supported Vigor Routers. Through these central management platforms, the Network Administrator can perform provisioning and firmware upgrades to VigorAP 920R Series, and get an overview of client statistics. 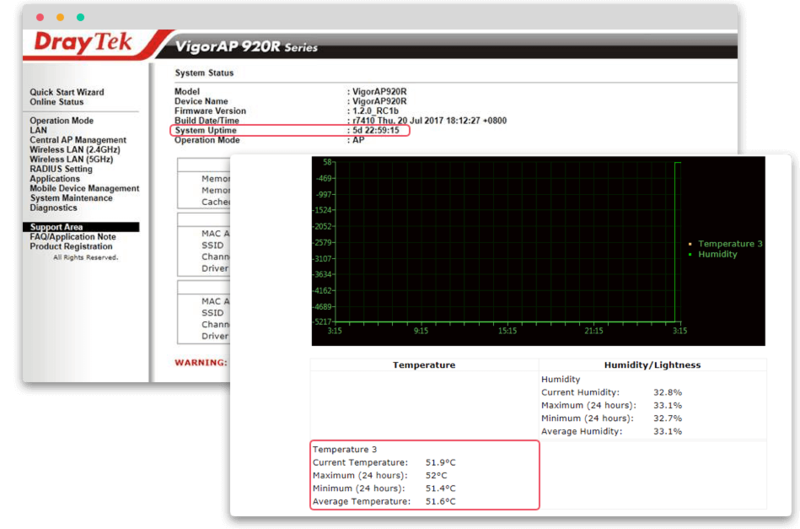 The DrayTek VigorACS 2 central management system Dashboard view shows the most important status information of the VigorAP 920R Series AP on the one page. The VigorAP 920R Series AP has an integrated temperature and humidity sensor which continuously monitors the environmental conditions (Temperature and Humidity) around the access point. If the VigorAP 920R Series AP internal temperature or humidity exceed the pre-set thresholds, an alert will be sent to the system administrator via Syslog or E-mail. Please click this link http://eu.draytek.com:50920/ for VigorAP 920R series web interface.